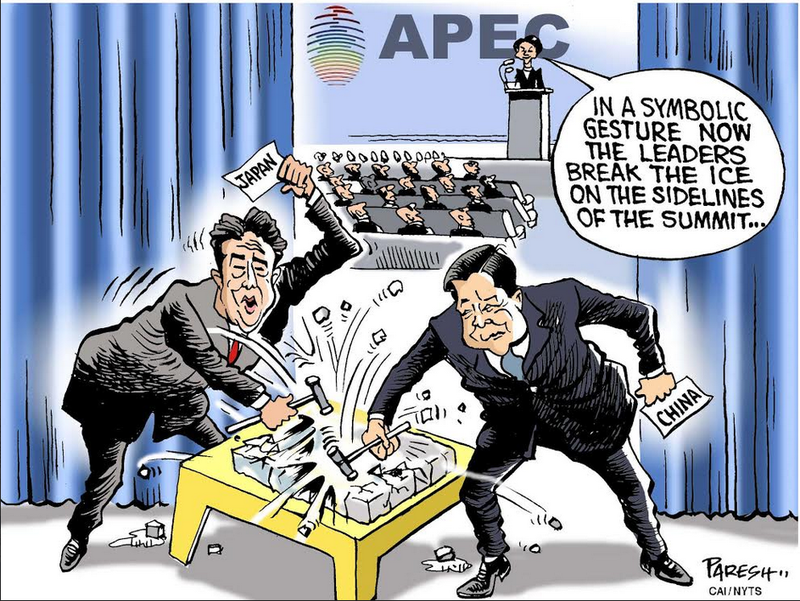 The historic meeting between the leaders of China and Japan, held hours before the APEC Economic Leaders’ Meeting convened in Beijing, hopefully will lead to an easing of tensions between the two countries, ending a period when the relationship was in free fall. 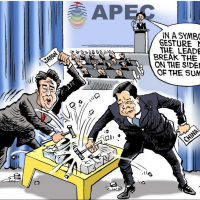 While the four-point agreement announced on Nov. 7 prior to a meeting on Monday between Chinese President Xi Jinping and Prime Minister Shinzo Abe was commendable, neither side has actually changed its position in public. Thus Xi, commenting on “severe difficulties” in the relationship, said “the rights and wrongs behind them are crystal clear,” implying the responsibility was on the Japanese side. This is not a time for trading accusations though China, as the victim of Japanese aggression in the 1930s and 1940s, can occupy the moral high ground. Great nations, like Japan, cannot be expected to grovel in public, but neither can they evade responsibility for their actions, as many perceive Abe to have done, with his denials of invasion and of responsibility on the “comfort women” and war crimes issues. Hopefully, the two sides will now put aside their disputes and not do anything overtly to revive them. But this will be difficult now that the Chinese conduct regular patrols in the waters off the disputed islands, which they call the Diaoyu. Japan administers the islands, which it calls the Senkaku, and ships from the two sides will inevitably come into contact. Significantly, the establishment of crisis management mechanisms “to avoid contingencies” is something both sides agreed on Nov. 7. The four-point accord reaffirmed “the principles and spirit of the four basic documents” between the two countries. Aside from the normalization agreement of 1972 and the peace treaty of 1978, the other documents are the joint statements issued during the visit to Japan of then President Jiang Zemin in 1998 and of President Hu Jintao in 2008. The islands don’t figure in any bilateral agreement although former Chinese paramount leader Deng Xiaoping stated at a 1978 news conference in Tokyo that both sides had agreed to shelve the dispute. The history issue was not so prominent at that time. But Abe, through his words and actions in the last two years — including recent praise for Japanese war criminals as people who had “staked their souls to become the foundation of their nation” — has raised doubts about his and the Japanese government’s interpretation of history. In the latest agreement, the two sides said they would squarely face history and advance toward the future, adding: “Both sides shared some recognition” that they would “overcome political difficulties that affect their bilateral relations.” Use of the word “some” suggests that the two sides are far from full agreement on what is needed to improve relations. This is good advice. Abe was able to thaw relations with China during his first term as prime minister in 2006-2007 and did not visit Yasukuni while in office, a practice followed by all his successors, until Abe broke his own tradition in 2013. Since Abe assumed office nearly two years ago, he has sought to win friends by visiting 49 countries but, notably, until last weekend, did not visit China. Not coincidentally, he has also not visited South Korea, where he is also not welcome. Japan cannot afford to remain isolated in its own neighborhood. It is high time that it mended fences not just with China but with South Korea as well. To do this, Abe doesn’t have to change his views on history, but he has to keep them to himself. Frank Ching is a Hong Kong-based writer who has covered developments in China for several decades. He opened The Wall Street Journal’s Bureau in Beijing after the U.S. and China established diplomatic relations in 1979, becoming one of the first U.S. reporters to be based in China since 1949.